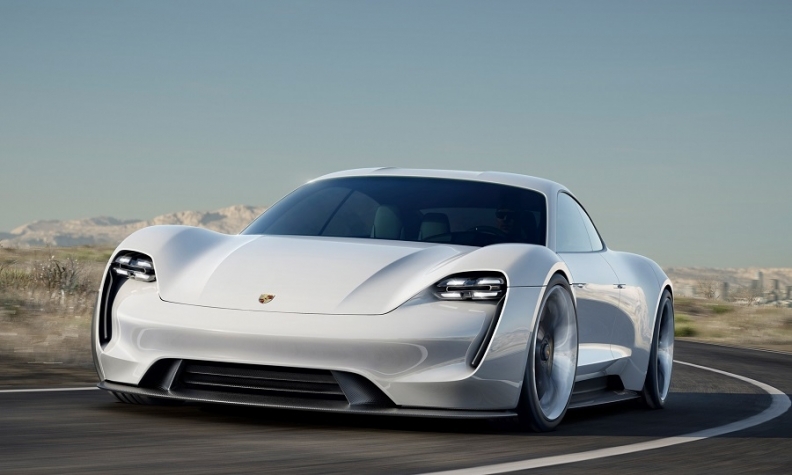 Porsche's Mission e concept, shown, will go on sale as the Taycan. MUNICH -- When the call came, Robert Wickel wasted little time. The subject? Reservations for Porsche's all-electric Taycan were coming, even though the vehicle wouldn’t enter production until next year. Buying Tesla's Model S, available for the past six years, had always been an option but lacked the allure of the first battery-powered car from the iconic German sports car maker. "Tesla's Model S triggered curiosity to give it a try, but there were several unknowns starting from unclear delivery times to a patchy service network," said the 46-year-old Munich resident, who has been driving Range Rovers, Audis and Porsches and joined the list to place an order when they are available. The Taycan "is a serious car with the quality promise of a leading car manufacturer—I know whom I’m buying from and what can expect in case I need support," Wickel said. The Taycan, developed under the project code-name Mission E, is one of a wave of Tesla fighters about to roll off the production lines of premium European carmakers including Jaguar with its I-Pace, Audi with the e-tron, Mercedes-Benz with its EQ range and BMW, starting, well, just about now. Count it as another headache for Tesla CEO Elon Musk, whose tweets about taking the company private are reportedly under review by the Securities and Exchange Commission. To date, Tesla has ruled the roads for electric car buyers, with little direct competition in the market from $60,000 and up. Those days are over: Jaguar is already delivering its I-Pace full-electric model with comparable entry-level prices to the Model S sedan and Model X SUV. The I-Pace comes with a pedigree of luxury, racing and engineering prowess. In some markets the wait list is now a year long. 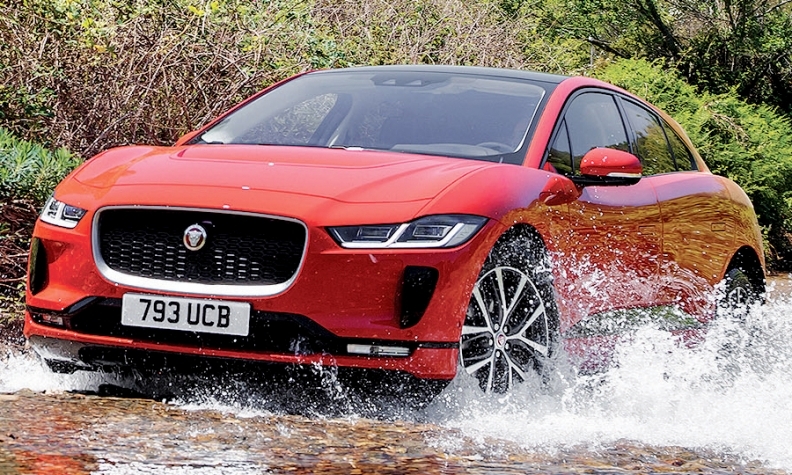 The battery-powered Jaguar I-Pace has off-road capability. The new rivals are likely behind some of the softness that Tesla has experienced in Europe. 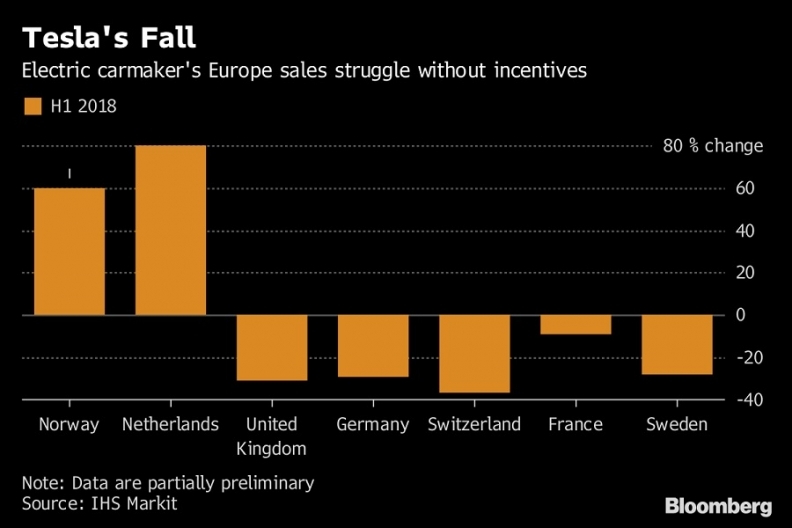 Sales in all major markets there that don’t offer significant rebates slid during the first half, data from forecaster IHS Markit show. The drop was as much as 30 percent in Germany and the UK, the IHS data show. Tesla doesn’t report pan-European sales numbers, although the IHS estimates are consistent with delivery data kept with national governments. Tesla does report revenue for Norway, where sales peaked in the fourth quarter of 2017. Customers there are also in quiet revolt after waiting for months to get spare parts and repairs. "Growth in sales for Tesla in markets like Norway and the Netherlands remains incentive led," said Tim Urquhart, an analyst at forecaster IHS Markit. "In the UK and Germany, well-heeled early adopters have adopted and are already looking at the next shiny thing." Tesla disputes the IHS and government data and says total sales are rising in Europe, while declining to provide any market-by-market details. "The data from both IHS and regional transportation departments is not reflective of actual sales data," Tesla said. New-car registrations cannot be relied on to track actual vehicle sales, Tesla said. Increasing competition complicates Musk's quest to transform his unprofitable juggernaut into a viable market leader. The Model 3 is still partially made in a makeshift tent, raising questions about the sustainability of ambitious output targets and criticisms over poor quality. A Tesla spokeswoman couldn’t immediately comment for this story. The debate about newly introduced models from competitors and Tesla’s recent problems on production and delivery will be "even louder in the future," said Karsten Gross, a spokesman at PA Consulting. Europe is not alone with slowing markets. The company forecasts 100,000 sales of Model S and X this year, compared with about 101,000 in 2017, when sales jumped 33 percent. Tesla's response to increased competition and an aging Model S is the Model Y, an electric crossover due to be introduced later this year or early in 2019. Of course Musk's problem now isn’t demand but supply. The carmaker has taken hundreds thousands of deposits for its Model 3 sedan—more than a year of production at current rates—and an order book that grows as more Model 3s reach driveways across America. The Model 3 isn’t available outside the U.S. yet. "The sales and demand trends, it's looking really positive," Musk told analysts after reporting second-quarter results and predicting that its string of losses would soon end. Tesla's own future is now unknown after Musk surreptitiously tweeted Aug. 7 that he was considering taking the company private in a $82 billion deal, a disclosure that seemed to catch the company off guard and created a new distraction for the board. The SEC is investigating Musk’s claim that he had funding secured, according to the Wall Street Journal. Should a deal happen, it might actually ease cash concerns and help Tesla grow. A deep-pocketed partner "should enable the company to execute and move faster," Evercore ISI analyst George Galliers said in a report. "This only increases the need for transition at traditional carmakers who must carry out exhaustive powertrain restructuring if they choose to compete with a potentially faster and more nimble Tesla."